What difference does it make to work in a union facility versus a non-union facility? Can the differences be quantified and measured? The evidence illustrates that unionized nurses earn more. They also have better pension and health care benefits; better sickness and accident benefits; contractual protections for safety on the job; better job security; protections from discretionary actions by the employer; and a powerful voice in their workplace. Union members also have the ability to advocate for their patients and for quality health care in a real and enforceable manner. In fact, according to a study published in the Journal of Nursing Administration (March 2002, vol. 2, No. 3), patients—specifically patients suffering a heart attack—have better outcomes in a union facility compared to a nonunion facility. The difference between unionized and non-unionized nurses is also reflected in their pay scales. According to the U.S. Bureau of Labor Statistics, the difference in median weekly earnings for 2004 shows that there is a 27 percent wage advantage in union facilities (all industries, public and private) over non-union facilities. Furthermore, the union wage advantage (all based on median weekly earnings) for women is 33 percent, for African-Americans is 35 percent, for Latinos is 51 percent, and 11 percent for Asian Americans. It is clear that being unionized makes a world of difference, in obvious and measurable ways. Furthermore, the benefits of unionization extend well beyond those of simple self-interest. The contract and the union make a difference in the lives of its members, as well as a difference in the patients they care for and serve. NENA’s mission and vision is to promote quality health care by advocating for the collective interests of healthcare providers and their patients throughout the Northeast. In contrast, hospitals have embraced the corporate health care model, which has resulted in huge profits to the detriment of patients. Tens of thousands of preventable patient deaths and injuries occur due to inadequate nurse staffing levels in hospitals. Ensuring enough direct care nurses are by patients’ bedsides would drastically improve patient care. The California Nurse Association (CNA/NNOC) succeeded in winning legislation that sets minimum nurse-to-patient ratios for all of California’s hospitals, creating improvements in the quality of care and in recruiting and retaining nurses. Since California enacted its ratio law in 2002, nearly 100,000 additional RNs have been licensed, a yearly average that is triple the number before the law. NENA is fighting to win similar legislation for the sake of patients and nurses. NENA also works to ensure that nurses and other direct caregivers are not subject to mandatory overtime. Many states have won this important protection for the sake of our patients and ourselves. Where this protection has been won, nurses and other direct caregivers can no longer be forced to work beyond their agreed to, predetermined, and regularly scheduled daily work shifts, except in cases of real emergencies. Lastly, NENA believes that all people deserve access to quality, affordable healthcare. We strongly support single-payer healthcare and will dedicate the necessary resources to continue to educate and mobilize our members to win desperately needed health reform in our commonwealth and in our nation. Without a union contract, employers make decisions about staffing, benefits and working conditions as they see fit. Too often, such decisions reflect a bottom-line approach, prioritizing profit and executive salaries above the needs of patients and the dedicated staff that care for them. The only way to turn this around it to win the legal right to negotiate over staffing, benefits and working conditions through forming a union. Tens of thousands of Registered Nurses in every corner of the Northeast have won the union and the ability to negotiate improvements – and guarantee them through a legally binding contract. Retiring with dignity is something every nurse deserves. At non-union facilities employees’ retirement benefits can be non-existent or can change without input from the staff. NENA nurses have retirement benefits they can count on. Once nurses organize their union, retirement benefits along with other terms and conditions of employment become mandatory subjects of bargaining, ensuring that healthy employee benefits remain intact throughout a nurse’s career. Temple University Hospital Pension: Temple contributes 8.5% of employee’s salary annually after two years of service (up to $7500) per year). This is in additional to nurses’ contribution. Crozer Chester Medical Center: Retiree Health Care at 60: if a nurse wishes to retire early, she can keep health benefits for herself and spouse and pay only half of the premium until age 65. Butler Memorial Hospital: Retiree health care at 59 ½: Nurses at Butler Memorial Hospital have won substantial employer contributions towards retiree health care between the ages of 59 ½ and 65. Forming a union gives nurses the right to sit down with management to negotiate over their wages, benefits and working conditions. Unionized nurses can file grievances and enter into arbitration to protect themselves from unfair harassment and treatment on the job. Increasingly, nurses and health care professionals throughout the Northeast recognize that organizing within the work place is their right. Organizing is not a defiance of management; it is a legal declaration for equity, justice and positive changes. As a result of this activity, NENA union members are the highest paid nurses in the region and among the highest paid in the nation, with a host of industry-leading benefits and protections guaranteed by their union contracts. To assist nurses in achieving these goals, NENA provides an experienced staff of organizers, researchers, educators, and labor negotiators to help nurses in all facets of workplace advocacy: from advice on exercising their legal employment rights to negotiating and enforcing employment contracts, to building community and political support for nursing and patient care issues. Training, knowledge and protection are the tools needed to be effective advocates for yourselves and your patients. NENA can provide these tools…but only you can put them to work. Once empowered, there is no limit to what union members can achieve. The first step for winning a voice on the job is educate yourself and your co-workers about NENA, and develop a committee of RNs from every department and shift who are interested in organizing. Working with NENA staff, informational meetings will be scheduled for nurses to attend and have their questions answered. Once RNs from all units have met and expressed support for organizing the union, NENA authorization cards or a petition will be circulated for RNs to sign. When a strong majority of nurses have signed authorization cards or a petition, NENA will petition the National Labor Relations Board (NLRB) to conduct a secret ballot election. Union elections are conducted at the facility and take place during working hours. Your employer does not see your ballot or your authorization card, and they will not be present during the election process. After you win an election, you have a voice on the job! Your employer cannot change existing practices without bargaining with you and your co-workers first. Nurses will elect a bargaining committee and local officers who will work with NENA staff to bargain your first contract. 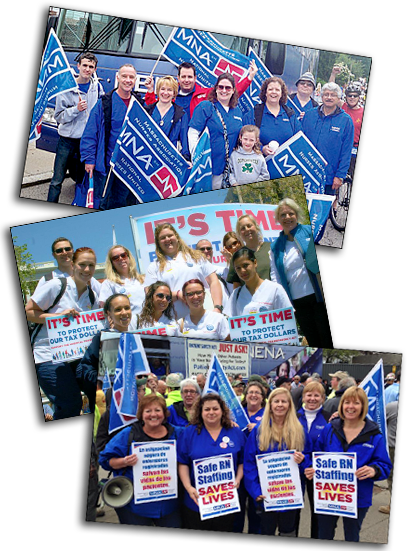 After a contract is voted on and ratified by all NENA RNs at the hospital, NENA staff will continue to work with local officers and leadership to build the union at your hospital. Members of NENA do not pay dues until a first contract is negotiated and ratified by the affected members. NENA dues vary by region and income level. Like all decisions in the union, the nurses voted on this dues level because it is fair and equitable while providing resources to negotiate great contracts, help others nurses organize, and fight for safe staffing legislation. You have the right to talk to you co-workers about the union during work time, just as you are allowed to talk about other personal issues, such as what you did on your day off or where your family went on vacation. You have the right to hand out materials on non-work time (breaks etc. ), in non patient care areas such as the break rooms, cafeteria or locker rooms. You have the right to attend union meetings while off duty, and sign a union authorization card. Your employer does not have the right to retaliate against employees for union activity. Your employer does not have the right to tell you existing benefits will be discontinued if the facility is unionized. Your employer does not have the right to ask you about your union activity or how you are voting. These and other legal protections are enforced by the National Labor Relations Board and federal courts. The union is the nurses. Nurses elect their co-workers to be their representatives and all decisions are made by nurses. At a hospital level, members vote on their coworkers to represent them in contract negotiations and other local union functions. However, wide participation is always encouraged. We are stronger together! Nurses at your hospital will pay nothing in dues until a contract has been negotiated and ratified by all the nurses. That means that you pay dues only after you’ve voted on a contract that contains the kinds of improvements to salaries, benefits, and working conditions that will make nurses want to stay at your hospital. Like all decisions in the union, the nurses voted on this dues level because it is fair and equitable while providing resources to negotiate great contracts, help others nurses organize, and fight for safe staffing legislation. NENA affiliate unions enjoy productive and collaborative relationships with many employers. These employers recognize that when healthcare providers have a voice on the job, patient’s win and healthcare is quality healthcare is delivered in the most effective way. However, some employers are frequently threatened by the idea of their employees forming a union and sharing power in the workplace. When this happens, employers may hire anti-union consultants who will help conduct a campaign to keep you from voting for the union. The key is to remain united and remember why you wanted a union in the first place.